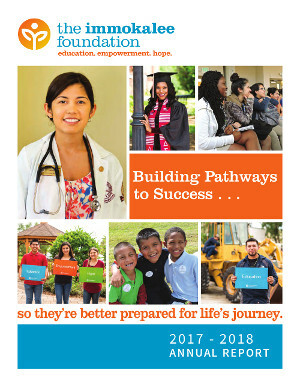 The Immokalee Foundation has enjoyed another outstanding year of building pathways to success and celebrating milestones with students of all ages. These young people have learned about themselves, the are in which they live, and the world. These important lessons can happen only with the help of their families and teachers with the Foundation board, staff, volunteers and other mentors, our community partners and local professionals, and with our generous supporters. In other words – adults who care. We are happy to share with your our progress throughout the year. Please click here to view the most recent Annual Report.